The military-minded franchise worth billions with recent record-snapping sales has another lawsuit in its lineup of legal perplexities. Activision Blizzard, publisher of the Call of Duty franchise, has countersued Jason West and Vincent Zampella, claiming the two former Call of Duty development studio executives tried to "hijack" company assets related to the war-themed first-person shooter series. West and Zampella, former heads of Call of Duty development studio (and Activision subsidiary) Infinity Ward, were fired early last month, according to Activision, for "breaches of contract and insubordination." 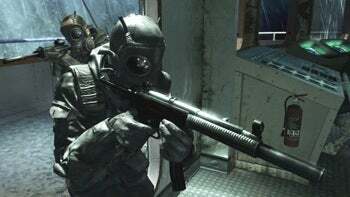 Activision subsequently spun the franchise into its own business unit, and created a second studio, Sledgehammer Games, to develop an action-adventure game based on the franchise. West and Zampella quickly followed up by filing suit against Activision for over $36 million in royalties and damages, alleging they were wrongfully terminated and their contacts breached. In their complaint, filed on March 4, West and Zampella claim that Activision "refused to honor the terms of its agreements," was "intentionally flouting the public policy of [California] that employers must pay their employees what they have rightfully earned," and that Activision hoped to either "[get] away with not having to pay them anything or maximiz[e] its leverage to reduce that pay." Activision's response in a 23 page countersuit filed Thursday in Los Angeles calls West and Zampella "self-serving schemers" and states it fired the pair because of "an unlawful pattern and practice of conduct," including an attempt to "steal" the Infinity Ward development studio. In an email, Zampella and West's attorney responded on Thursday, calling Activision's claims "false and outrageous" and accusing the company of stalling to avoid paying the pair "the millions of dollars they all earned and that Activision owes them." Follow the bouncing decimal point? With millions (or more) on the line, the reputation of a multi-billions franchise interlinked, the next game due out this fall, and rhetoric like Activision's already comfortably slinging, this could get uglier than it already reads in short order.